Depth filtration glass micro fiber. Fine porosity, medium flow rate, with a 0.7 micrometer size particle retention. Frequently used with Grade D to filter diluted aqueous solutions containing strong oxidizing, acidic, or alkaline components prior to laser spectroscopy. May also be used for TCLP analysis and collecting extremely fine precipitated proteins, including immunoglobulins. Binderless borosilicate glass microfiber. 80 grams per meter squared basis weight. Depth filtration categorizes filter media that traps particulate within the random matrix of fibers found within the thickness of the media. The efficiency rating of the filter is characteristic of the complex pore structure that develops as the fibers overlap. The fibrous material within the filter is commonly glass micro fiber or polypropylene. In depth filters such as glass micro fiber, the purity of the filter is dictated by the presence of, if any, binder material that acts as a strengthening agent and aids in holding the fibers together. Because of the characteristically high flow rates of depth filters, they are generally used in applications such as single and multi process removal of sediment and course particulate. 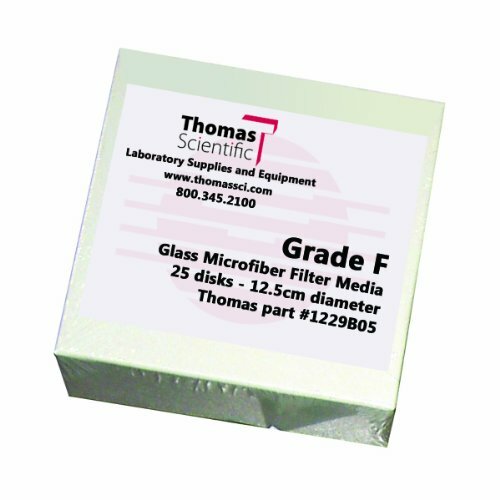 Glass micro fiber filters are available without binders, making the inertmatrix an ideal medium to entra-sediment for further analysis and counting. Also, depth filtration media is commonly used as pre-filtration prior to surface filtration substrates such as membranes. View More In Glass Fiber Filters. If you have any questions about this product by Thomas, contact us by completing and submitting the form below. If you are looking for a specif part number, please include it with your message.